Click the "Code Wizard" link in the getting started section of the Dashboard. In the "Domain" field, enter the URL of the page you wish to capture. Note: The code wizard allows you to preview PRO Feature requests, even if you are not upgraded! 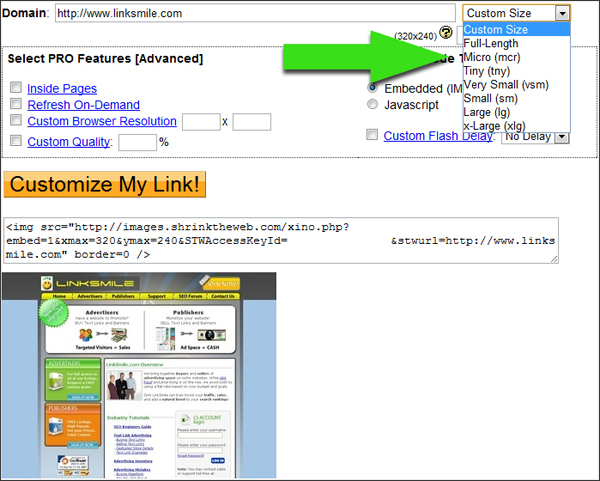 Select from one of our six (6) default sizes, Custom Size, or Full Length captures from the size drop down menu. For Custom Size and Full Length captures, specify the desired height and width in the fields below. 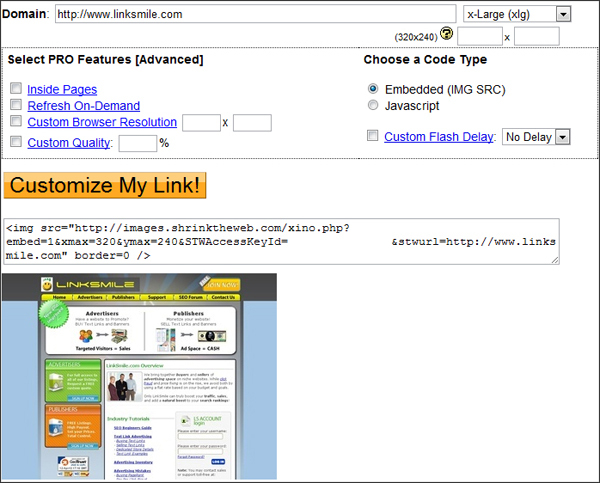 Once you have entered all of the desired settings, click the bright orange "Customize My Link!" button to generate the code and get a screenshot (up to 700px wide). Note: Since the "Thumbnail Queued" image is cached in browsers for several minutes, new requests may capture much quicker than it would seem. To ensure that you get the images back as soon as they are done, be sure to use [CTRL]+[F5] in order to force a browser refresh. Try out the Code Wizard now!